The U. S. chart above is for the time President Barack Obama signed a bill to reopen the federal government and lift the debt limit It was just after midnight on Thursday morning, October 17, after an 11th-hour agreement reached on Wednesday by Senate majority leader Harry Reid and minority leader Mitch McConnell was passed by the Senate and the House of Representatives. The Senate voted 81-18 in favor of the the measure, while the House voted 285-144 in favor. The bipartisan votes in both houses of Congress set the stage for an end to the 16-day government shutdown hours before the federal government’s borrowing authority was set to expire. Speaker of the House John Boehner conceded earlier on Wednesday that his conference’s strategy to demand concessions in exchange for reopening the government had failed. “ Blocking the bipartisan agreement reached today by the members of the Senate will not be a tactic for us,” he said in a statement. The U.S. chart above is the one I use, and is for the signing of the Articles of Confederation. I relocated it from York Penn. to Washington, and progressed it to Nov. 17. when the the president signed the agreement at 12:05 AM. 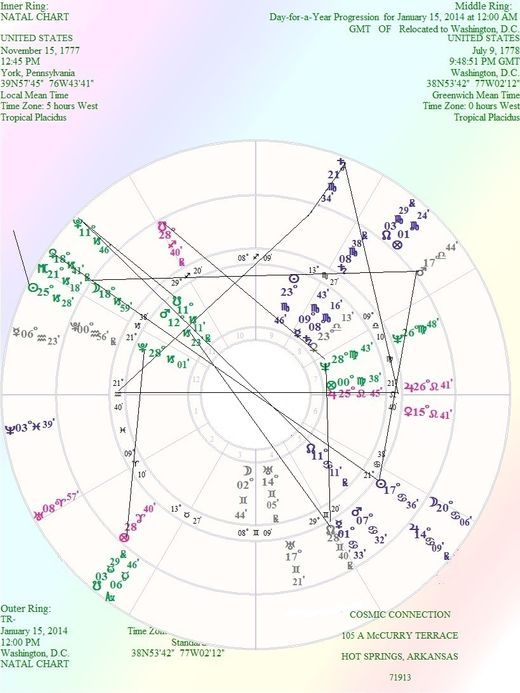 Notice that the transiting Sun came up to conjoin the natal U.S. Venus in the financial 8th house, and transiting Mercury was trining the progressed U.S. Sun from 17 Scorpio to 17 Cancer. 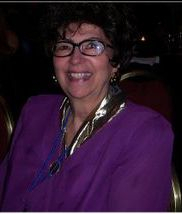 That was the good news, however, at the same time, the transiting Moon in early argumentative Aries was squaring the progressed U.S. Mercury in early Cancer, as well as transiting R Neptune at 2 degrees of Pisces opposing transiting Mars at 1 degrees of Virgo, and the recriminations still went back and forth. Natal Saturn at 8 Scorpio was conjoined by progressed Saturn at the same degree and opposed by the transiting nodes at 8 Scorpio and Taurus. Again, the money signs in the money houses. The aspect I have been watching however, is the progressed U.S. nodes at 28 degrees of Gemini and Sagittarius T-square natal Neptune at 28 degrees of Pisces in the 7th house, within 2 minutes of arc. Of course, Neptune refers to Obama's health care program, and the Gemini node refers to dual arguments. The influence of the Sagittarius south node tells us that many foreign nations think we are nuts! When you convert the numbers involved to the related events, it reaffirms the validity of this chart. For example, on the one hand, the progressed U.S. Moon at 16 Capricorn reflects the 16 days the government was closed. On the other hand It opposes the U.S. progressed Sun at 17 Cancer which ties into the amount of the federal debt, which is almost 17 trillion dollars. Since the Sun represents the president, with this opposition, and the Moon ruling the people, he has been hearing from Americans about their frustrations with the economy, and has been criticized about his lack of leadership. Seems like he can't win! The number, 28 involved in the Neptune T-square relates to the federal law that allows a child to be covered on his parents health policy until 28 years old; while under state laws, it is until 26 years old; the degree number of progressed Neptune. The Uranus (computers) square Pluto (insurance- the masses) describes the glitch in the Obama health care sign-ups on line. Since transiting Uranus sits on the U.S. 2nd house of money markets, banks, financial institutes and the national wealth, the stability of of these are threatened. Talking about Uranus squaring Pluto...I was born in 1934 and have a tight T-square between Uranus in the 10th, Pluto in the 1st and Jupiter in my 4th at 23 degrees of Aries, Cancer and Libra. In world events, it was then that Hitler officially become the Führer on August 2, 1934, and the downfall of the German republic had officially begun. Over the course of the next 19 months, a variety of events would drastically increase Hitler’s power over the German government and German military. It would only be a matter of time before Adolf Hitler attempted to assert his power over the entire continent of Europe. WWII started for America on Dec. 7th 1941, when I was 7 years old as Japan unexpectedly bombed Pear Harbor, (the degree number of my Sun in Aquarius in my 8th house). In a way, my whole life has been riveted around that era. That includes the music, which I later played as a professional musician, to the World War II movies and documentaries, and anything else related to that era. However, getting back to our current situation, Obama said he hoped lawmakers in both parties would learn from the shutdown and swear off governing by crisis. Asked whether he was concerned about this process repeating itself in just a few months, Obama replied simply, “N0. However, the following chart for January 15, 2014, tells a different story. Transiting Saturn at 21 Scorpio T- getting nearer to the U.S. natal Sun squares the 1st and 7th house cusps. The Sun at 25 Capricorn forms a T-square to to the square of the Lunar eclipse of October 18. 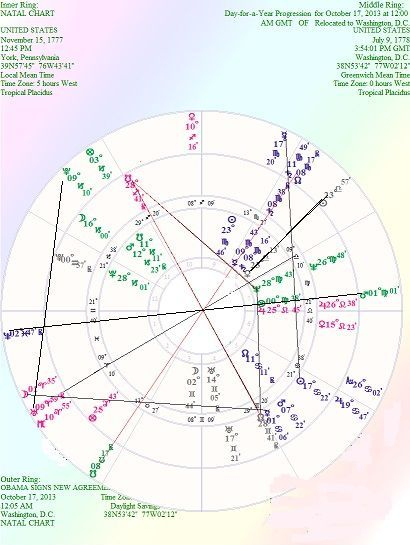 Transiting Neptune has moved up to 11 Capricorn to conjoin the natal U.S. south and north nodes; spelling more confusion on solving this national problem. Now, the progressed Sun opposes T-squares transiting Venus conjoining the progressed Moon, and squaring transiting Mars. I would think that Obama's popularity will continue to go down. Hopefully, no harm will come to him then. Natal U.S. Pluto at 28 Capricorn squares the progressed part of fortune at 28 Aries in our financial 2nd house. No help there either. So it looks like the can will again be just kicked down the road!